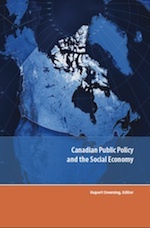 The Canadian Social Economy Hub has produced three final publications building on the results of the national, 6-year research program. Download pdf or epub (for e-readers) versions of the e-books below. Order printed copies from the University of Victoria bookstore. 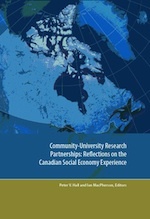 Edited by CCEDNet Research Committee Chair Peter Hall and Canadian Social Economy Hub Principal Investigator Ian MacPherson, this book explores lessons for community-university engagement by reflecting on the experiences, achievements and challenges of the Canadian Social Economy Research Partnerships (CSERP). 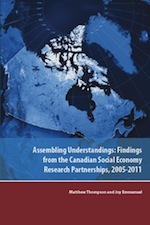 Between 2006 and 2012, the six regional nodes and the Hub conducted research on the social economy in Canada. This research entailed an unprecedented level of pan-Canadian experimentation within collaborative models of engagement, knowledge creation, sectoral (self) definition and policy development. While some parts of the social economy are professionalized and have formalized organizational structures that interact well with the university sector, important parts are emergent, informal and highly localized. Each of the CSERPs had to grapple with longstanding questions about building and sustaining community-university partnerships. In Community-University Research Partnerships each of the nodes and the Hub describe their experiences in developing meaningful approaches to partnership-building and engagement and share insights on the process and challenges of forging (and maintaining) practitioner-university engagement.